Cooking the beef bones yields both beef marrow to flavor these dumplings, and the bone broth in which they're served. The dumplings are made simply with eggs and breadcrumbs, salt, and nutmeg. A traditional recipe from Austria. Using a sharp knife, remove marrow from bones and melt the marrow in a pan over low heat. Run the melted marrow through a fine sieve and let cool. Reserve the marrow stock. When the marrow is cool, pour into a bowl and beat for 3-4 minutes, until frothy and white. Season to taste with salt and nutmeg. Mix in the egg and breadcrumbs to form a thick mixture. Place the mixture on a lightly floured surface and divide into 4 even parts. Roll each into a thin 8-inch-long roll. 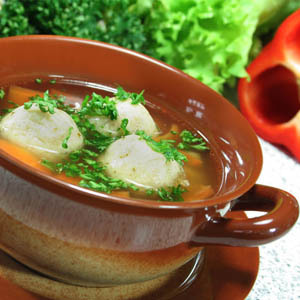 Place the dumplings into simmering slightly salted water and cook for 8-10 minutes on low heat, or until cooked through. Do not let the water fully boil or the dumplings will fall apart when removed. Serve the dumplings in the heated reserved broth.